Governor Greg Abbott’s (R) security plan in response to the Santa Fe High School attack includes placing armed veterans in Texas schools for defense of students and teachers. Details are set forth in the School and Firearm Safety Action Plan, released May 30, 2018. The plan calls for a greater law enforcement presence throughout Texas schools by all means necessary. This includes having officers use schools as a stop for “breaks, lunch, or to file reports.” Abbott’s plan also asks schools “to provide office space for a local or state law enforcement official to work from.” He is asking the state to consider grants to help school’s offset the cost of providing such space and accommodating a great law enforcement presence. Texas public schools are permitted to hire any person who is a licensed peace officer to provide campus security. Texas retired and off-duty peace officers already have extensive firearms and emergency response training, and many would be willing and able to protect Texas campuses. 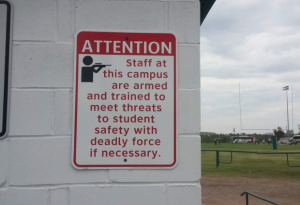 Texas should authorize schools to prioritize recruitment and hiring of such personnel to protect their campuses and their student bodies, faculty, employees, and guests. Hiring should prioritize individuals with the most applicable skill sets (i.e., former police, sheriffs, and constables). In addition, the state should create a pathway for our veterans – many of whom have extensive firearm training – to help protect our schools through a modified school marshal program that ensures they have the appropriate training to transition their expertise into the campus environment. Veterans who complete tailored training and background checks should have the ability to once again serve their communities in times of need.